There is something to be said for being able to walk everywhere. That’s part of why people love living in West Market, a community across the street from Reston Town Center. In fact, West Market residents can walk to the grocery store, restaurants, the movie theater, the W&OD trail, and anything else they could need (even Target is walking distance). One of my favorite West Market amenities is the private pond that has a walking trail around it (it’s about 1/2 mile total around the pond). You can do the loop several times, take the trail to the W&OD trail, or sit on one of the benches and read a book on a gorgeous day. It’s peaceful and lovely. 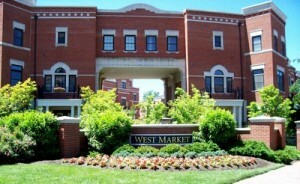 West Market was built in the late 1990’s. Five builders came together to create this architecturally diverse community. Most people first notice the rounded exteriors that are unlike anything else in Reston. Spacious common areas include a clubhouse, which includes a main hall and kitchen for meetings and gatherings, a fitness center and sauna, and an outdoor pool. The dwelling units comprise two condo communities: The Lincoln Park community has 104 luxury, 2-story townhome style condos. Madison Park has 122 condominium units (24 of which are townhouses) within seven buildings.